I went on a cleaning spree last month and I was worried about cluttered bookshelf which spoilt the whole interior décor that is when I decided upon decorating my bookcase shelf. I read a lot of articles , took tips and tricks from wherever possible and finally decided upon DIY decor ideas for my bookshelf case. It has been a tedious process but the outcome was worth it! How many times have you attempted to decorate your bookshelf, only to find it looks worse than before? Well, count me in, I am in the same boat as you are. But after designing and de-cluttering I finally achieved it. My bookshelf has not only transformed but now is a piece of art that everyone is going to notice and compliment on! I turned my bookshelf into a stunning display. Decorating my bookshelf has actually been a process of living room, who knew books could be viewed as décor?! I am bibliophile and the bookshelf redecorating was fun. My bookshelf case is a floating bookshelf as I like it when my books are all at one place and when they don’t take too much floor space. Decorating your bookshelves can be expensive but once you have de cluttered , invest a little time in creating your own décor pieces and you’ll be surprised by the transformation. Most of us would like built in bookshelf cases in our homes for they hold books and help keep us organized. Without bookshelves our homes would be filled with piles and piles of reading objects! If you are willing to go the organized way and yet want your interior shelves to look beautiful you are bound to find ideas and tips that meet your designing needs. Wouldn’t it be great if bookshelves could be as fun as they are functional? From shelves packed with books to shelves that make strategic use of empty space, you’re bound to find an idea that meets your design needs. Transform bland bookcases and wall shelves into stunning displays with 18 top bookcase decorating ideas pictures that will add some excitement to your shelves! here are 21 ways to arrange your shelves, be it wall shelf wall décor or a bookcase shelf décor, Today we, blingsparklers explore ways to use bookshelves to heighten our design possibilities,are you up for some revamping and stunning DIY decor? The very first step to making your bookshelf stand out is to throw away all the unwanted objects, either put them away hidden or place them else ware. I had lot of jewellery and stationary stacked up on my bookshelf , I had to get rid of it and use colored boxes to keep small items in order to make it pop . Plus cleaning and dusting small objects every now and then is a pain. Don’t go too far with following rules and decorating it the way you think people will like. Display things you are passionate about, take your time and come up with a design you will later be content with . Let a bookshelf be decorated in such a way, that when you see it you know it speaks of you and puts a smile on your face. Thanks to technology the number of books have decreased but no matter how many books you have the placement is what matters. Display all those good looking , expensive books in the front, placing books by their cover also works. Stack up and group your books based on subject, color scheme or even their size to create a classic and organised look. boxes and baskets are functional but baskets and boxes that look pretty can be used to showcase and even keep your stuff hidden. Put your vintage boxes on display, what better than bookshelf? A balance is important when designing your bookshelf. Maintain a powerful balance by arranging art work,vases books and figurines in such a way that the larger items are balanced by other larger items. the best way to add visual interest and increase height of your book shelf is to use stacked books as a platform and placing interesting objects on them. In my case I placed a beautiful treasure box carved out of wood. Check down for the pic. If you are going for more neater and uniform look , you can cover your books in cool plain uniform papers for a monochrome look. Or if you are more of a color coding kind of person you can leave your reading materials exposed like i did and arrange books according to their outer color. In India in the 2000’s most of the homes had showcases where we Indians used it as a display space to showcase our precious art, antiques, photos, trophy's etc . But when you have a bookshelf , I think a bookshelf doubles up as an art display. You can make your bookshelf as a stage and display your ceramics,porcelain, family heirlooms, photographs creative DIYs and your artistic objects! Mixing in art with books is a win-win for art adds the instant pizzaz needed for a bookshelf to stand out. Incorporating artwork is a must as it gives a classic look. You can even jazz up your bookshelf by painting the back of the bookshelf wall. Bold and bright colors make the bookshelf stand out, but if you are looking for a more thrifty way to cover the back walls then you can use wallpaper in geometric prints or metallic floral wallpapers to make your bookshelf stand out! Well if you are wanting to make a bold statement? Let paint do the talking for you! Another way to make your bookshelf stand out is go the asymmetric way. Forget about similar height shelves , jazz up our shelf with varying shelf heights if you are getting a bookshelf built. You can store large items or interesting statues in long shelf cubicles and stack books in the short ones. You can build a bookshelf f varying heights on your own . The best diy shelves to build a varying bookshelf using crates is simple ,get one done for your home now! Read the full tutorial to make one here. If you have a large home with too many wall bookshelfs or two –three of them and don’t have enough books to stack in them , its best to go the minimalist route and leave it empty by getting the interiors of the bookshelf painted in the same colors of the walls. It will look classy and create an illusion of a large room. Or you can stack in a few books in all the book shelves and leave a few empty spaces to master the neat look. Invest some time in using old frames to create beautiful hand made art. Create your own artistic frames (read the full tutorial here on making your own beautiful artistic painting frame) and place them on lower shelves so that they are in eye level with the seated guests. This way your beautiful DIY art won’t go unnoticed and unappreciated. If you love uniformity then you can paint the whole bookshelf with the same color as the paint of your walls which will give a very uniform look. Neat and clean. You can d this on your own, all you need is some paint and a brush! Either use simple frames to create layers on a shelf or DIY old frames by repainting them and placing empty frames to create visually striking geometric prints. I placed mirrors behind my books and art work in my bookshelf because I thought the mirror was adding depth t the bookshelf . You can also place mirrors give depth to your bookshelves. You can stack books either by placing them straight or leaning them to create a beautiful classic library look. If you are the ones with expensive books in bulk, this is what you have to go for. decorative item be it eye catchy statues, beautiful porcelain or even frames , its important to create a balance between the both while designing your bookshelf. Decorative objects look striking when arranged with books and act as decor for your bookshelf. Get sculptural, place a beautiful bowl, a ceramic plate or even a antique old box with your stacked books to fate that perfect balance between books and decor. Bookshelves are not just for books, you can place baskets in the shelves to tuck away anything ugly or non stylish! Best part you can DIY the baskets on your own from soare cardboard boxes lying in your home. Check out the full tutorial here on DIYing a basket! When your bookshelf is painted white (in most cases) you can use long clear vases or huge clear jars as book stoppers. fill in the clear objects with seashells or a mixture of flowers and water and you have a beautiful piece of artwork as book stopper ! Inexpensive and attractive! What say? With these beyond brilliant 20 decor ideas you are sure to make your bookshelf a piece of conversation. 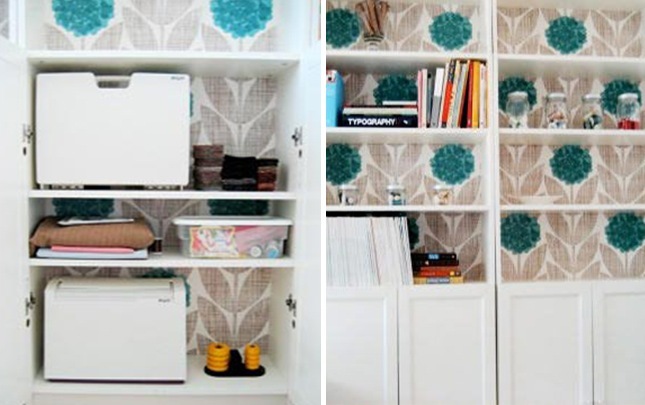 From funky wallpaper to simple DIY projects that will give your bookshelf a major quirky upgrade! Do you plan on decorating your bookshelf too? Tell us in the comments! This is how I made my bookshelf drab to fab. You like?